Set in the main square of Afitos, the church of Agios Demetrios was built in 1858 on the ruins of an early Christian church. 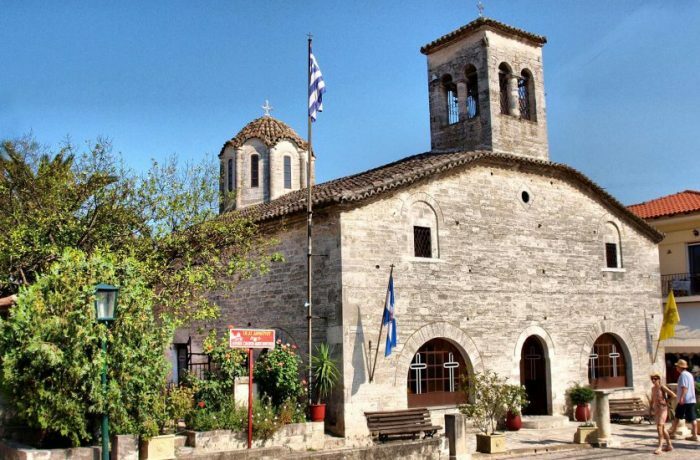 The Basilica of Agios Demetrios was built with locally quarried stone and is the largest Eastern Orthodox Christian church with a dome in Halkidiki. The church is open all day and the locals regularly attend services. It is a triple-shelled basilica with a dome, with a built-in bell tower, narthex, female and courtyard. Of particular artistic value is the stone-framed representation of the founders on the south wall of the temple, as well as the stone dove in the bell tower. The carved wooden iconostasis of the church is decorated with floral paintings and icons of the 19th century crafted by Georgios Athanasiou from Galatista. In the central aisle, there is the icon of the Virgin Mary of Afitos crafted in Constantinople in the 14th century.